Disclosure: I was sent these books to review free of charge from Ideals Books. All opinions in this post are my own. I did not receive any other compensation for this review. I am including links to each item for your convenience but do not receive anything if you purchase them. God gave us dominion over the creatures of earth. He gave humans the job of keeping the earth. To teach this lesson, I found a great book called God's Amazing World! 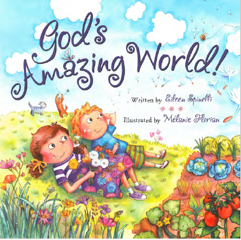 written by Eileen Spinelli and illustrated by Melanie Florian. In this beautiful book Gracie is sitting on her porch painting when her younger cousin, Bo, comes over. He asks about her painting and she shares with him the story of creation from Genesis 1. She explains she is painting each day of how God created the world. Bo has not heard the story and asks questions, so Gracie shows him different things and they play while telling the story. They flap their arms like birds, they run through sprinklers, they look at the sky and find shapes in the clouds, they try peaches and they end with a nap in the hammock for day seven. What I love about this book is the playfulness in it. It is a child telling another child the serious story of creation. 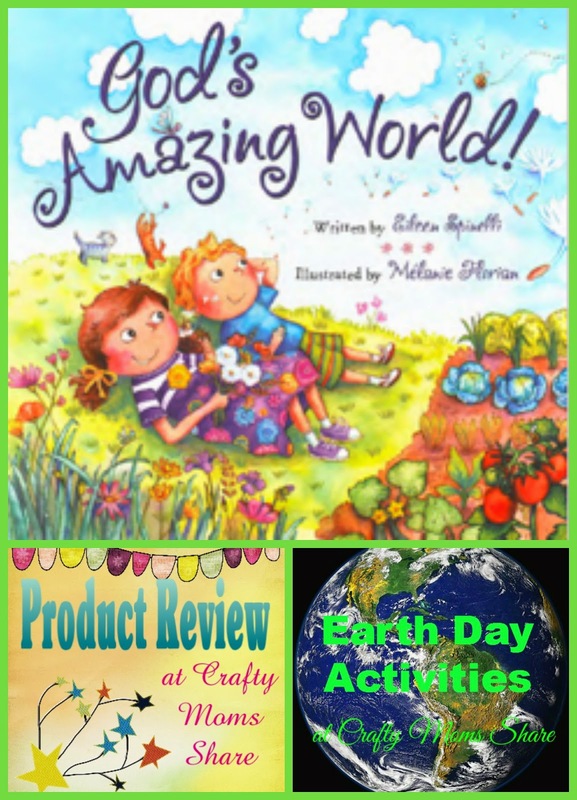 They find ways to play with each part of creation and have a good day together telling and exploring the story of creation. I looked at many other stories about creation and did not find one like it. I feel it really comes to a child's level to enjoy a Bible story and see how it applies to every day life and his or her life. The entire book is fun and colorful and the title truly fits the book. Gracie describes an amazing world to Bo and the amazing way that God created it in seven days. After reading this book the thought of destroying the world is so far from one's mind. I know I read it and feel that childlike love of the world, nature and everything here. It makes me feel small, but important in God's eyes. I know I have always been one who questions people who litter and who always recycles and tries to hang my clothes out on the line in good weather, but after this story the idea of littering or hurting animals or their habitats seems so awful and wrong. Hazel and I planned on her making a painting to represent the story of creation, but we have not had the chance to do it yet. Hopefully this summer when things calm down and all the sickness leaves the house. This book is a wonderful addition to our bookshelf and would also be wonderful for a religious school or church to use with their young classes. It is fun and non-threatening and shares the story of creation in a new way without leaving out the story at all. It is also the perfect reminder why Earth Day is every day!